Troudt Plumbing and Heating has been providing boiler services for years in Greeley and the surrounding area. Our experts repair and replace boilers, adding efficiency and safety to your system. The most important thing to know about boilers: Regular cleaning and maintenance will increase operating efficiency. This helps reduce the likelihood of a more costly boiler repair call. Planned maintenance contracts will help you avoid many of the breakdowns caused by neglect. What Do We Do During a Boiler Maintenance Call? We’ll open the boiler doors and clean the insides of the boiler. Then we'll check gaskets, seals and all working parts. Finally, we replace whatever is worn. We will inspect the burner and pilot light, and examine the clean air damper and blower assembly. If needed, we'll repair those parts. We’ll also make any needed adjustments to the burner, inspect and oil all pumps and motors. Any system problems reported by on-site personnel will be investigated. Learn about the 10 most common boiler problems. If your boiler is leaking, shut off both the power and water and give us a call immediately. Our experienced plumbers will solve your boiler problems quickly, saving you on labor costs as well as down time. 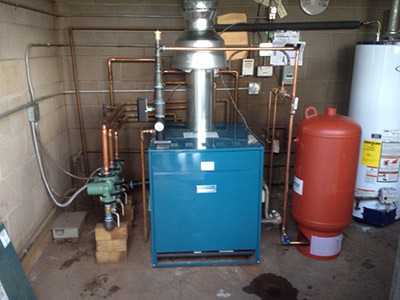 If you require emergency boiler service, call us at 970-356-2053. To discuss a maintenance contract, or if you have questions, please contact us and we will get back to you just as quickly as possible.